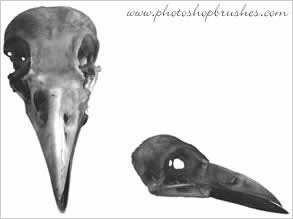 Two Photoshop skull brushes based on digital photographs of a crow head. The Crow died quite recently by the looks of it. I found it under a tree while searching round the farm. I've kept the Crow skull as it will lose more of the skin in time and will no doubt look quite different, will post new images after it become whiter. I also am now collecting any other skulls I find, these will be added to the Photoshop Brushes website in time. If you like Skull Photoshop Brushes there are loads more featured on my site, with Rabbit skulls, Cat Skulls and many many more.